A portion of our incorporation document. 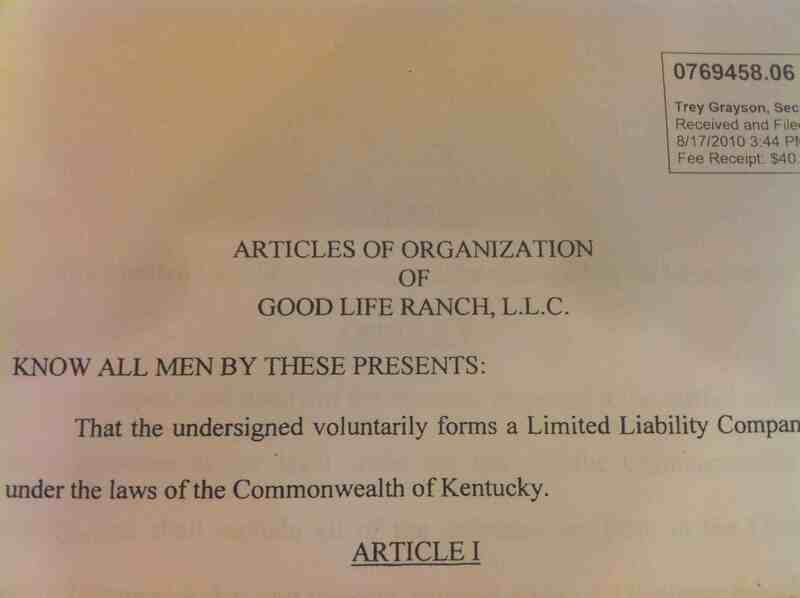 We are now officially Good Life Ranch, LLC. We formed a Limited Liability Company in order to …. surprise, surprise …. limit our personal liability for things that could go wrong here on the ranch as well as protect ourselves from the double taxation that other corporations face. I know that you are able to form LLCs and S-Corps online through websites like Legal Zoom and others, but we wanted to use a local attorney to ensure that everything was written up properly and that all the papers got filed with the correct department at the state and county levels. It was actually not that much more expensive than doing it all ourselves online… only about $85 more than the online estimates. To me, that’s a small price to pay to have an expert available to answer your questions. When you form a normal corporation, it comes with a lot of paperwork and the income gets taxed twice – once when the company earns it and once when the company pays the income to the employees (us). In an LLC, on the other hand, the income flows through the corporation to the owners’ personal accounts. Then the taxes on income are paid once. An LLC also doesn’t have to keep monies separate like a corporation does, nor are board meetings required. All big pluses. The disadvantages of forming an LLC are that it’s harder to attract investors and it costs more for lawyers to draw up agreements for LLCs. Both of these disadvantages have to do with the relative newness of the LLC as a business option. Neither of these drawbacks are big deals to us right now. We’re not looking for investors and we don’t envision needing too many agreements drawn up by attorneys. This is a simple legal procedure, and protects us from some liability issues. Basically, we wanted some protection in case something unforeseen happens. We want to make sure that we are driven to bankruptcy or lose our farm in the case of someone getting hurt while on our property or gets sick from eating any food we produce. Of course, our food will be healthy, nutritious, and uncontaminated when it leaves our property, but we have no control over how people store it after they leave here. These days people are so sue-happy we wanted to take steps to protect ourselves and our assets from someone who might be tempted to make something up with the hopes of making a quick buck. Sorry for the non-farming post, but a big part of farming is business and I’m trying to develop some business sense after being in the education world for a decade.